Rescuers carry equipment across the rubble of a grocery store where five people were rescued. Port-au-Prince, Haiti (CNN) -- Five people were rescued Sunday from the rubble of a grocery store, officials told CNN, 24 hours after the effort to reach them began. Three of the people trapped in the ruins of the Caribbean Supermarket -- a man, a 13-year-old girl and a 50-year-old American woman -- were rescued earlier in the day by a joint New York fire and police department search and rescue team. A Creole-speaking man and woman were rescued late Sunday night by a team from Miami, Florida, and a Turkish team. The man came out first, picking his head up off the stretcher carried by his rescuers and giving the thumbs-up sign. He said he had been eating peanut butter and jelly from the store to survive. The effort was dealt a temporary setback Sunday afternoon when the floor over rescuers' heads -- described as a concrete slab -- buckled as they were working in a 3-foot-high area, said Lt. Charles McDermott, spokesman for Florida Task Force 2. Debris rained down on the rescue workers as they ran outside of the building. They stood outside and embraced each other as they called roll to make sure everyone had escaped. Work was temporarily suspended as rescuers evaluated whether they should reinforce the floor or work in a different area, McDermott said. Rescue personnel worked throughout Saturday night and Sunday to free the people, Capt. Joe Zahralban of the Florida search team said, at times crawling through spaces that were so tight they could only take half a breath. Zahralban had the opportunity to tell the rescued American woman's sister that she is alive. "She dropped to her knees and thanked us," he said. The Florida rescuers also called the woman's son, who lives in Pembroke Pines, Florida. "After we told him, he went silent for a moment," Zahralban said. The man and teenage girl found alive earlier in the day were taken to a U.N. hospital at Port-au-Prince's airport, where the girl, about 13, was treated for leg injuries and the man treated for undetermined injuries. They are believed to be Haitian nationals, officials said. As of Sunday, more than 60 people had been rescued alive by rescue teams from the United States and other nations, Tim Callaghan of the U.S. Agency for International Development (USAID) told reporters. Americans have rescued about 30 of those, he said. A U.N. search and rescue team freed one of its own, Jens Christensen of Denmark, from the rubble of the collapsed mission headquarters Sunday where at least 37 people have been confirmed dead. He told his rescuers that others were still alive, saying he had heard tapping nearby, but not since Friday. Those trapped in the supermarket had been living off the store's inventory of food and water, authorities said. "If I was going to be trapped for five days in the dark," Zahralban said, "one of the best places to be is in a supermarket surrounded by food." Separately, other members of the New York team rescued a 55-year-old man trapped in the rubble of a four-story building in Port-au-Prince. They used a rescue camera to locate the man, and then a paramedic climbed into a narrow space with him and started an intravenous fluid line to combat the man's dehydration as rescuers used jackhammers and cutting tools to free him. The man had been trapped since Tuesday, the NYPD said in a statement. He was suffering from dehydration but otherwise not seriously injured. Other rescues took place as well. An Israel Defense Forces medical and rescue team said Sunday it had rescued a Haitian government worker Saturday after he was trapped for 125 hours in the rubble of a customs office. After the rescue, which lasted eight hours, he was taken in "moderate condition" to an IDF hospital. It was the first live rescue by IDF, according to a statement. 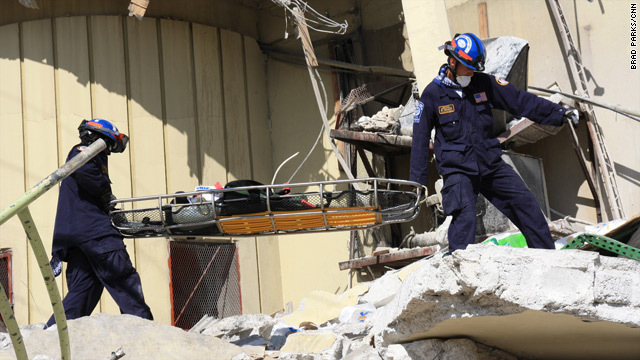 Also Saturday, a team with Los Angeles County Search and Rescue answered the desperate, but futile, pleas of a mother who believed her young daughter was trapped alive beneath the rubble of a day care center in downtown Port-au-Prince. Despite the distinct sounds of tapping from within the crushed concrete, the rescue effort turned into a recovery operation eight hours after it began when crews failed to get further responses from whoever was trapped inside. Elsewhere in the capital, rescue crews responded to a text message from a 30-year-old woman beneath the ruins of the collapsed bank where she worked. Dogs picked up the scent of survivors within the rubble several times, but by early Sunday, rescue crews hadn't seen or heard anything with high-tech cameras and listening devices. Also rescued Saturday: a 2-month-old baby in critical condition with injuries that included broken ribs. Rescue personnel worried she could contract a deadly case of pneumonia and doctors rushed her to the airport where she was evacuated to Jackson Memorial Hospital in Fort Lauderdale, Florida. CNN's Anderson Cooper, Susan Candiotti, Rich Phillips and Mary Lucas contributed to this report.